Showers are not free; you pay a dollar for eight minutes. Love it here but the phone number is wrong,,,,it is supposed to be 406-560-0248 that toll free number is not correct! We stayed overnight it was exactly as advertised full hook ups and wifi at each site. The wifi slowed down at prime time but very acceptable. There is no cable or antenna TV. Very friendly staff showed us to our site. Loved the story about the owners and their 9 children plus the raccoon "little girl". Also we had Fun hiking down to the river with the dog. Stayed there two nights in early June on our way to Glacier NP. The people were very friendly and helpful. The grounds were beautiful with plenty of privacy. They have a chapel on site for Wednesday and Sunday services with a community meal on Wed. night. There is a stream you can fish in. I did and got my first strike with a fly rod. 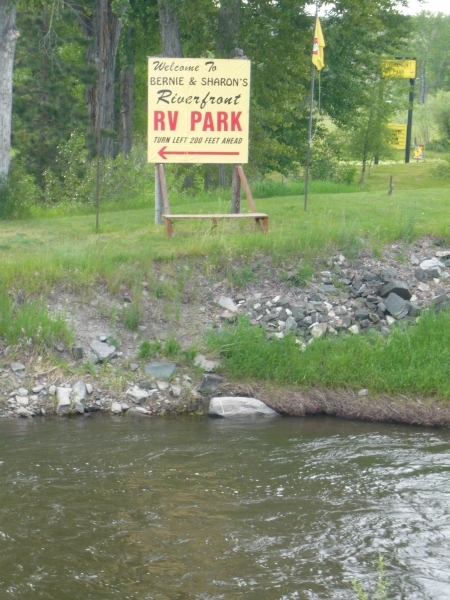 Don't miss this campground. We'll be back! Everything that Jet said is true. That was exactly what we experienced. 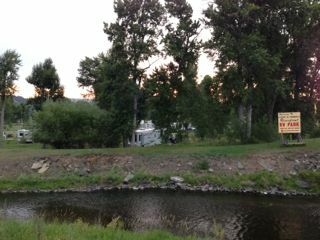 This is a nice and easy stop over point between Bozeman and Missoula. We called in the morning to make a reservation and they txt'd us our receipt - which was a really cool high-tech feature. Make sure you know what exit to take to find this park, as there are no signs at all along the interstate - but it's super easy to find once you exit, and it's just far enough from the interstate that there's no noise. Upon arrival, a host greeted us before we could even get out of our bus, and escorted us to our site. Nice to not have to stop and do paperwork or check-in. He even offered our cat a treat! We were given an extra long pull through, with a decent sized 'front yard'. However, the hook-ups are all shared, so you are awning-to-awning with your neighbor. Thankfully, there was enough separation that this wasn't too bad. We had a nice open view of the mountains in front of us, and the park is pretty well maintained. There's a little stream that flows next to the park that is not visible from any site - so don't be expecting any river views here. You can climb up the berm and find some trails down to it however. All of the facilities are inside the main office, which they keep unlocked all night long. And they are pretty proud of their onsite non-denomonational chapel that is open 24-hrs. There's also a fun little vintage garden of old vehicles and stuff in the back corner that is interesting to checkout. We got to meet the owner of the park, Bernie - as he also owns the same model vintage bus as ours. Delightful and fun guy, and he has a lot of heart put into the park. The park does have WiFi, but it's satellite based - so super slow and was unusable during our stay (the park was mostly empty too). Our AT&T and Verizon got us online just fine however. Daily price below is with the Good Sam Discount. We were greeting upon driving in and led to our space, didn't even have to get out to register, they came to us, they enjoy meeting each guest personally. We loved it here, clean and friendly, with beautiful views all around. They have a chapel with Sunday service, we loved it and would stay again if passing this way. We paid $26.00 a day, cash or check only, included wifi. really large pull thrus don't even have to unhitch if you don't want to.